How to load fishing line What causes line twist? Line twist is a common problem for any carp angler using a fixed spool reel. It is something we cannot avoid and it is often the main cause of horrific line tangles around the reel or eyes of the rod, it could also cause the fish to bite less as we will discuss later. Firstly, what is line twist? Line twist is when the main line coming off the reel coils around itself and eventually tangles. It can cause the line to wrap around the tip of the rod or if really bad, can fly off the spool quickly and bunch up to catch on the eyes of the rod when casting. Line twist is only caused on fixed spool reels. It develops because as the line comes towards the reel straight it has to turn side wards in order to load onto the spool. It is mechanically impossible for line to turn through a right angle without twisting. This means that for every turn on the spool the line will create one twist, so as the reel is loaded it forms thousands of twists. 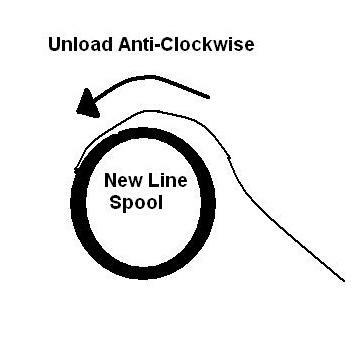 It is crucial that line is loaded onto a fixed spool reel correctly to limit line twist. Also, because line will twist as the clutch is used, it means the more fish we catch using the clutch, the worse it can become, even if only catching a few carp line twist can be rapid if the carp take lots of line from the reel clutch. For this reason some professionals back wind when playing fish as this limits the use of the clutch. It’s impossible to stop fishing line from twisting but it can be reduced. 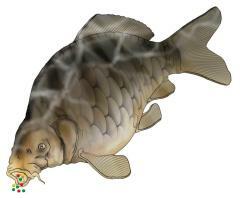 The problem when fishing for carp with twisted line is it may cause the line to spring up off the bottom. The line can loop up at each coil in the line. This means it will be much harder to completely pin the main line to the bottom so carp cannot detect it when swimming close to the lake bed. How can you limit line twist? You can minimize line twist by loading the fishing line onto the spool correctly. This is done by firstly checking to see which direction your reel's carriage (or bale arm) rotates. Look at your reel from the front, if the carriage rotates clockwise (which is the normal for most fixed spool reels), then you need to make sure the line comes off the new line spool anti-clockwise. Always loading fishing line onto a reel the opposite way to which the carriage rotates stops the line from twisting. Here are some pictures showing how to load fishing line correctly onto a carp reel. Fishing reels that have a bigger spool will naturally produce less line twist than reels with a smaller spool diameter. This means big pit reels will cause less line twists as there are less turns but more capacity of line. A spin doctor is a lead which contains angled groves. The groves in the lead causes the line to twist anti-clockwise as it is brought back through the water. Casting out and retrieving the lead takes out the twists. How much line twist is on the reel will determine how many casts will be required to eliminate it. As a guide, you don't want the spin doctor lead to spin in one direction for a long time after retrieval. If you let the spin doctor lead hang about 4 feet from the rod tip after retrieval, it should NOT spin anti-clockwise for very long. If it spins anti-clockwise for a long time then all the twist has not gone. 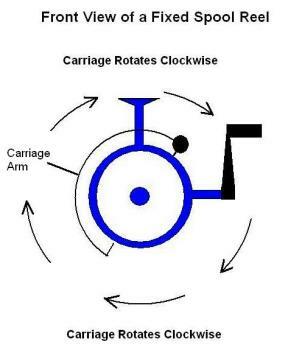 If it spins clockwise for long periods then you have added too much reverse twists. It is actually possible, and probably a good idea to place reverse twists on your main line when using the spin doctor. Firstly, get rid of all line twist, then re-cast it out one more time and retrieve it. This will place a little reverse twist on the line, thus in effect, you have a slight credit of "good" twists and it will go back to straight condition after the clutch has been used a few times. Placing reverse twists onto main line means it will take much longer for line twist problems to re-occur. "As a fish tip, if you wish to cast further distance then load new line tightly"
"Line Twist Must Be Checked & Cured Regularly"